Mix semolina, yogurt, salt, turmeric, ginger, oil. Adjust consistency by adding water. Keep the mixture aside for 10 minutes. Add eno to the mixture and mix the content gently. Pour the batter into the greased bowl and cook in microwave for 4 minutes. I cook it covered. Insert the toothpick and see if it comes out clean. Prepare tadka: heat oil, add mustard seeds, sesame seeds, heeng, green chillies, green peper and let it cook for 1 minute. Next Add water and sugar mixture. Boil the contents for 1-2 minutes and add lemon juice. Adjust the salt and sugar levels. 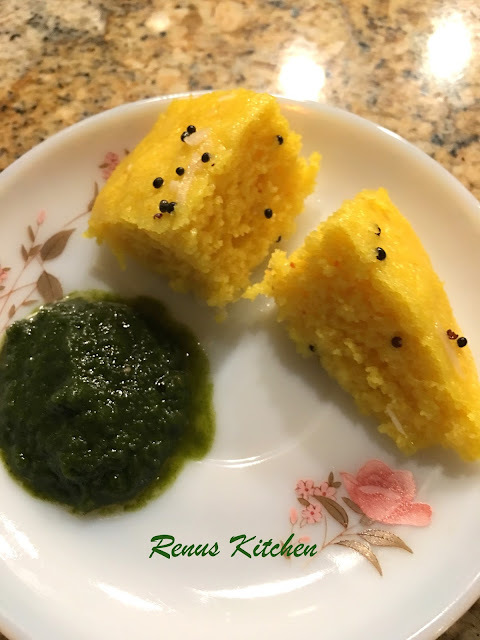 Pour the tadka over cooled dhokla. Cut squares and enjoy with your favorite chutney.